this past year i chose a word for 2015 & that word was REST. throughout the year, i followed my word by using the hashtag #findtruerest. i'm glad i did the hashtag because it's cool to be able to look back & see all of my thoughts in one place. the theme of finding rest in Jesus was very timely with a few things that happened throughout the year. going into 2015, we knew Thomas's job was ending (in 15 days) and we had no idea what the next steps were. all we knew was that no matter what happened, if Thomas was out of work all year, or if he found a new job right away, that God was faithful. because God is always faithful to us and in our corner, no matter what our circumstances are. He doesn't withhold difficulties if they push us towards Him. resting in that truth helped us to calm our fears about the future and just savor the season we were in. what ended up happening was this. Thursday, January 15th was Thomas's last day of work. on Friday, January 16th Thomas had an interview, and he was offered the job on Tuesday, January 20th. which in the corporate world is a very fast turnaround and it was just amazing. while we were very excited about the turn of events & in awe of how God worked things out for us, we weren't really shocked because that is what our God does. He held us tightly through the months of fear and the unknown, and now He was still holding us tightly through the new opportunities. Thomas has been at his new job for almost a year now, and he is already training new employees that join his department. he loves the job & it has been such a good thing, except for all of the overtime he's had to work. but now things are starting to (hopefully) level out for him. we weren't really sure what to expect with this job, but it has really opened some doors for our future and for that we are thankful. looking back on everything, we can see how God knew this would be better for us all along. going into 2015, i was burned out at my job. 2014 was my year of working too much overtime and the latter part of 2015 has brought some relief. i even got to work downtown for 8 months & that was such an awesome opportunity. i pretty much became BFF with all of duck kind & honestly that's probably what i will miss the most. yes, i'm a crazy animal person but i'm not sorry that i am! ;) getting back to a normal schedule this year, and working closer to where i live has been a nice rest for me. and it looks like it was needed because 2016 seems to already be bringing lots of new changes at work. and now it's ironic because going into 2016, circumstances are so different, yet some things are the same as they were going into 2015. in a way, we are in a similar spot in life. 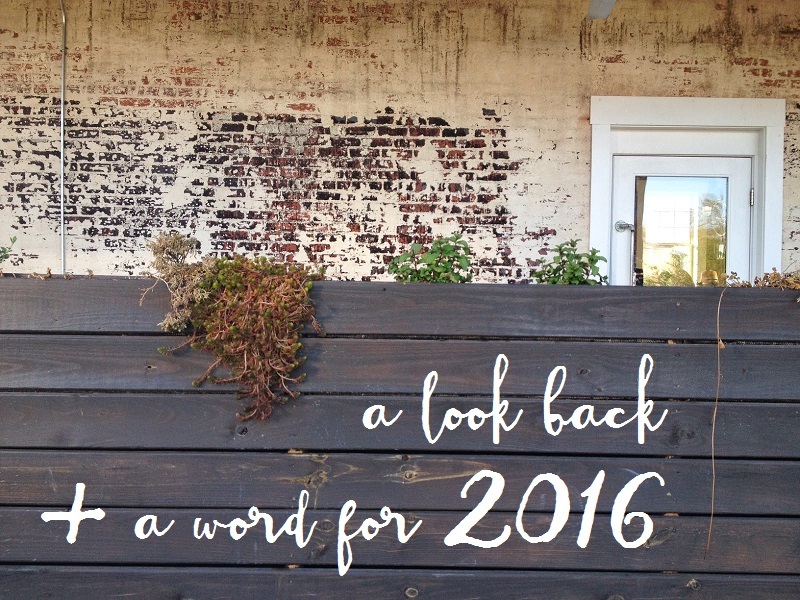 2015 held a lot of changes and challenges, and it's looking like 2016 may be the same. so in looking at our year ahead, i chose TRUST as my word for 2016. because i have a feeling that a lot of the changes coming are going to require us to trust in the Lord and what He is doing more than we ever have. but trusting the Lord through the waiting is definitely a privilege. and i can't wait to see what life is going to look like come December 2016! what are you hoping to cling to during this new year?